Exhibit on view April 5 to April 26 The true power of provenance is that it can connect the biographies of individuals from various walks of life through a shared a love of books and reading. This exhibit of manuscripts once owned by illustrious bibliophiles is intended to shed light on some of those connections. First there was bibliographer and literary scholar Sir Walter W. Greg who lived from 1875 until 1959. With fellow bibliographers Alfred W. Pollard and Ronald Burns McKerrow, Sir Walter cofounded what is now regarded as the Anglo-Saxon tradition of analytical bibliography. Next, there was Stanley Morison, who lived and worked in England from 1889 to 1967. Morison has gone down in printing history as one of the most well-known editors, typographic consultants, and designers to have worked in the trade. The current font known as Times New Roman is based on his revision of the type for The Times, London. 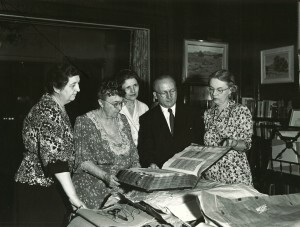 The other two personalities featured in the exhibit, Isaac Foot and Carrie Estelle Doheny, were included because of their accomplishments in book collecting. The collections of these two book people differed greatly in both substance and style, but they were both representative of two major currents in collecting practice; namely, quantitatively-driven subject collecting and qualitatively-driven genre collecting. The former was represented in the library of Isaac Foot. Foot, a staunch Protestant who lived from the years of 1880 to 1960, built up a massive personal library which had been numbered at somewhere between 50,000 and 70,000 volumes at its peak. A large portion of his collection was centered on the study of political philosophy and liberalism; and he possessed a great number of titles from some of the most renowned political thinkers and literary activists of the ages. Some of his more well-loved political influences included thinkers such as John Milton, Thomas Carlyle, and President Abraham Lincoln. Carrie Estelle Doheny, on the other hand, who would represent the latter style, had a noticeably smaller collection than that of Foot. The aesthetic quality of Doheny’s collection, however, was appreciably richer than the quality of the Foot library in the sense that it primarily contained manuscript and printed works denotative of a sophisticated artistic taste. A devout Catholic and philanthropist, her collection, which was built up during the years following her husband’s death in 1935, included numerous illuminated manuscripts and masterpieces of fine printing. She also collected rare examples of Americana and children’s literature. In terms of manuscripts once owned by these figures, each seems to have been indicative of his or her collecting styles. 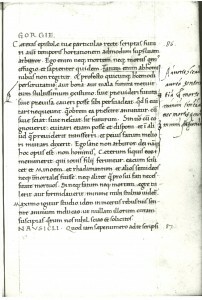 There was a thirteenth century manuscript copy of Stephen Langton’s Interpretationes Hebraicorum Nominum which was once in the possession of Sir Walter W. Greg. The fifteenth century Italian copy of Pseudo Phalaris’s Epistolae was previously owned by Stanley Morison and, therefore, was likely to have influenced his thinking on typographic design. Isaac Foot’s onetime copy of a dedicatory preface written by the Flemish humanist Victor Gislain is an item featured in the exhibit that is of particular rarity. This holograph document was discovered bound in the front portion of a sixteenth century printed edition of Prudentius’s Opera Omnia. Also included in the exhibit is a fourteenth century Ordo for the use of Rome which, for only a brief time, was owned by Estelle Doheny. The manuscript features a beautifully illustrated frontispiece on the recto of its first folio. Additionally, there are a number of supplementary archival materials on display. 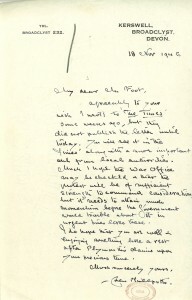 Among them is a photograph of Doheny with former Huntington Library curator of the rare books, Robert Schad, a catalog of a USC exhibit of Doheny treasures printed by the famous Los Angeles-based printed Ward Ritchie, and a letter from author Eden Phillpotts (d. 1960) to Isaac Foot.